The holidays put me in the mood for cookies! 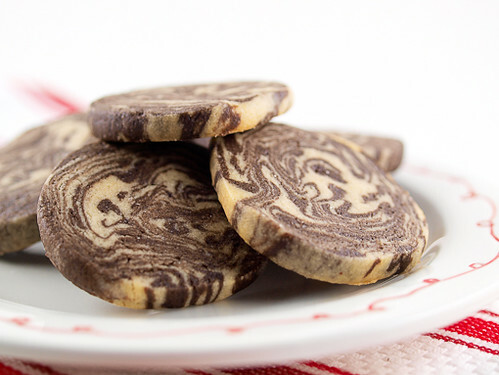 Of course, as you may already know, I love and adore cookies. Since it is the holidays I am in the mood for pretty cookies that taste really good. 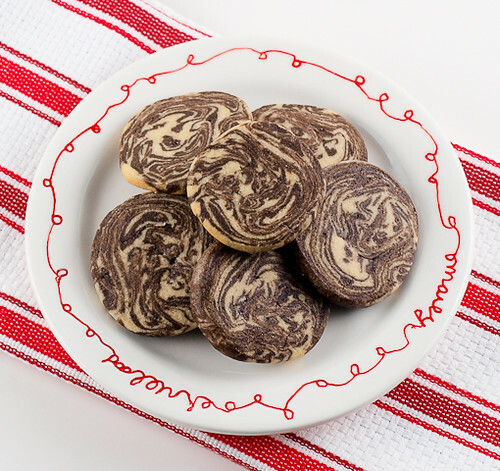 Those kind of cookies are not only good for nibbling on as you wrap presents but for great for giving as gifts. 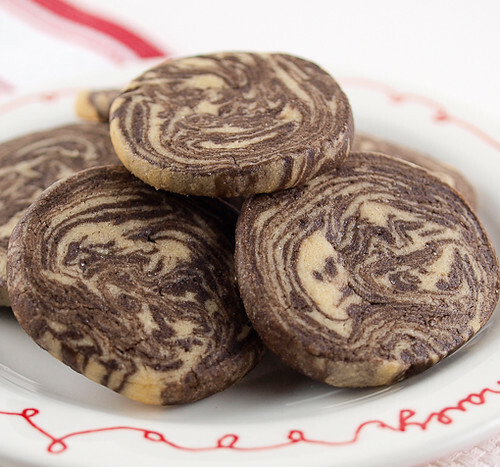 While thumbing through my cookie folder, and yes I do have a whole folder devoted to cookie recipes, I came across an old culinary school recipe for chocolate vanilla spirals. 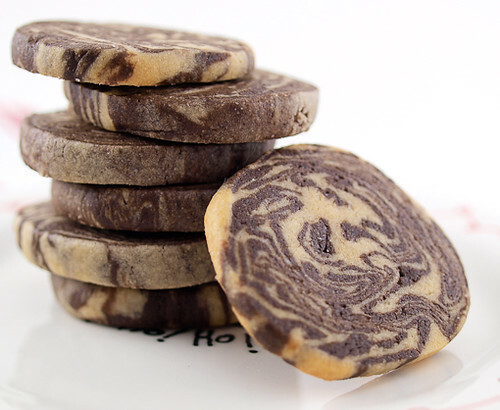 They are very formal looking cookies that have a ho-hum flavor. I knew I could do better. First thing I did was reformulate the cookie dough. Yes vanilla is good, but peanut butter is WAY better, so I added peanut butter to the vanilla dough. Next, I added more chocolate to the chocolate dough, transforming it from a mild, weak cocoa flavor to a robust bittersweet chocolate experience. Finally, rather than having perfectly formed spirals, which are lovely I suppose, I went a little Jackson Pollock and made marble cookies instead. They are unique and I think a little prettier than spirals, but if you want the formal look just know you can make them into spirals if you want. Begin by preparing the peanut butter dough. 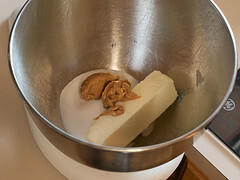 In the work bowl of a stand mixer, or in a medium bowl, cream together the butter, sugar, and peanut butter until light and fluffy. Add the vanilla, egg, and salt and mix until well combined. In a small bowl sift together the flour and baking powder. 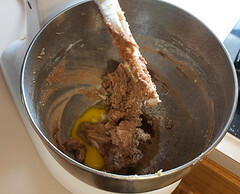 Add the flour mixture to the butter mixture and mix until a uniform dough is formed. Wrap the dough in plastic and chill for two hours. Next, prepare the chocolate dough. 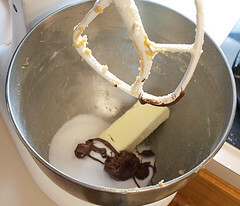 In the same work bowl you used before cream together the butter, sugar, and melted chocolate until light and fluffy. Add the vanilla, egg, and salt and mix until well combined. In a small bowl sift together the flour, cocoa powder and baking powder. 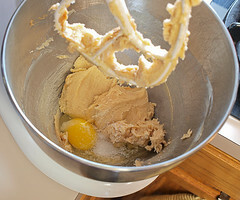 Add the flour mixture to the butter mixture and mix until a uniform dough is formed. Wrap the dough in plastic and chill for two hours. Once the dough is chilled roll each of the doughs out to 1/4 inch thick rectangle. Cut each rectangle in half. Working with one half each of the chocolate and peanut butter dough, place the chocolate on top of the peanut butter and fold the dough in half and then in half again. 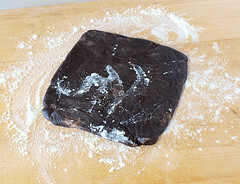 Flatten the dough, roll into a log, fold the dough in half and flatten again. 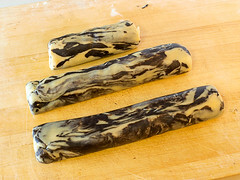 Roll the dough into a tight log, wrap with plastic and chill for at least two hours, or as many as three days. Repeat with the remaining dough. When you are ready to bake heat the oven to 375 F and line a baking sheet with parchment paper. 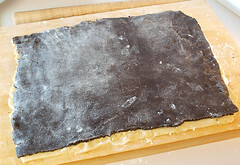 Slice the dough into 1/8″ to 1/4″ thick slices and place them 1 inch apart on the prepared sheet. 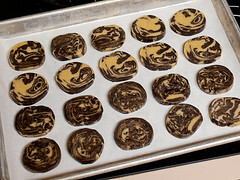 Bake for 8 – 12 minutes, or until the centers of the cookies are firm and the bottom of the cookie is golden brown. Cool on the tray for 5 minutes before transferring to a wire rack to cool completely.